I had been meaning to try out Blissful Bites‘ UnTuna Salad for quite some time now, and had bought the ingredients last week before I left for a friend’s wedding in Vegas. I chose this light, healthy dinner as the first one back purposefully, making it extra healthy by serving it over a bed of lightly dressed kale. 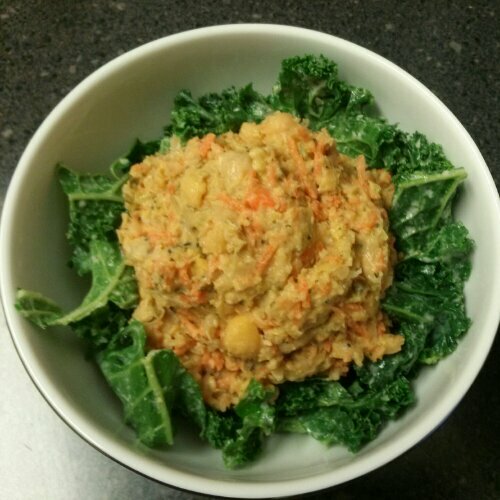 The dressing is just a tahini based something I threw together in the small bowl of my food processor, but I’ll include the approximate recipe below. For the Blissful Un-Tuna, I made a few adjustments. I went ahead and started by pulsing the chickpeas to a slight mash in the food processor, since it was being used regardless. I then used the fine grater for both the carrots (I used 2) and the celery (I used 1.5 stalks). I subbed dijon for yellow mustard, as I always do (I don’t really care about yellow). Surprisingly, I couldn’t find just plain kelp powder in the downtown Seattle Whole Foods, so I used Bragg’s Kelp seasoning. It came out really delicious! Even without having pure kelp powder it was plenty tuna-ish for me, and besides, we just adore chickpeas, so I knew this would be a win. Mince garlic in the small bowl of a food processor. Add all other ingredients and blend until smooth. Taste for seasonings and consistency. * I only used half of this dressing for one large bunch of kale, hence the lightly dressed!! first off, i’d like to tell you that this is only my second time making hummus. so if you’d like to try a more established source on the subject, i would not be offended : ) regardless, i have posted the recipe below. last week i had to use some apple cider vinegar and water because one of my lemons had gone bad. this week i kinda missed the apple cider taste. this will be an ongoing project. especially because we love eating hummus in this house, and it’s a good excuse to always have some ready. *i read somewhere that the secret to good hummus is combining the tahini and lemon juice first. that it forms an emulsion, and that it’s good for the hummus texture. when you mix the two ingredients, you do see it go from liquid to thick in a few pulses. does it help? i’m not sure. maybe i’ll have to try it the other way just for comparison purposes. hah. * if you’re using the same kind of tahini as i have pictured down there, make sure to get a spoon, scrape up any settled tahini at the bottom of the canister, and mix before pouring it for the recipe. mine had a very thin liquid on top and very hard sediment at the bottom from settling. 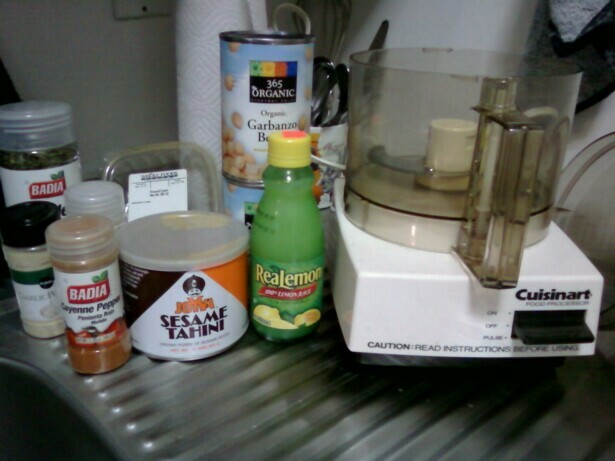 add lemon juice and tahini to food processor. pulse until combined. add all other ingredients and pulse to desired consistency. 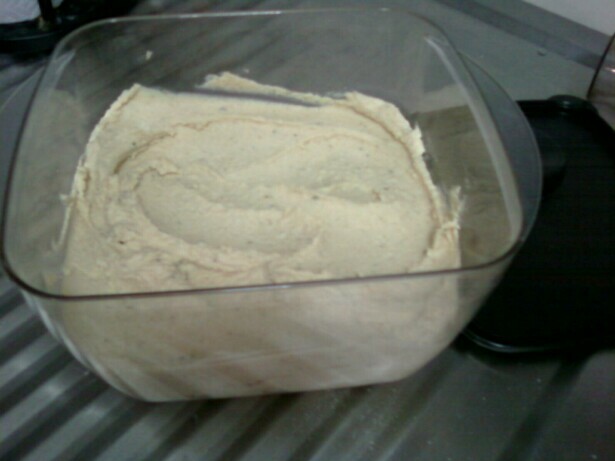 if hummus is too thick, or contents stop moving, add more water by the tablespoon until desired texture is achieved.